Easter holidays in Jerez is one of the most beautiful in Andalusia. The entire city is engalona to admire the beauty of the Pasos that run through its streets. Processions begin on Friday of Dolores (March 23) and end on Resurrection Sunday (April 1, 2018). One of the biggest attractions of the Saint Week in Jerez are its processions, dozens of brotherhoods parade through the streets of the city. They are sculptural ensembles of great cultural richness, which stage the different stories of the last seven days of Jesus’ life. The brotherhoods usually process in the afternoon and evening and during the day you can visit the churches from where the different processions start. Each brotherhood follows a different itinerary, although the last part of all the journeys is common for all and receives the name of ‘Official Race’ which ends in the Cathedral of Jerez. All balconies are decorated, people dress up and from them the singers dedicate their arrows to the Virgin and Jesus. 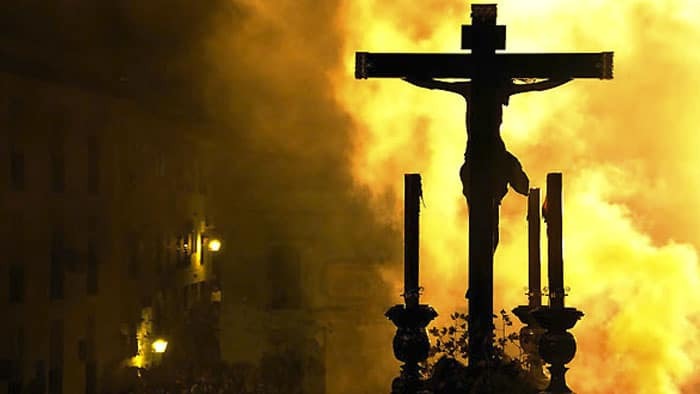 The Easter holidays in Jerez is a show, of light, color and smell, unique in the world that everyone should see at least once in their life. Of course not only brotherhoods, but also the good atmosphere that is lived in the city in those days, bars, terraces and restaurants to taste tapas and different drinks, and if the days are sunny, the proximity of Jerez to the beaches of the Bay of Cádiz. Due to the large number of motorhomes in the Motorhome Area of Jerez for Easter dates, we recommend our clients to make an advance reservation to ensure they have a seat. The price is the same and booking through our website is completely safe, since we use SSL security protocols in addition to connecting with banking gateway, always your data is protected. We keep our prices during the Fair and Easter holidays: € 15 / day including emptying gray and black water, as well as filling drinking water. From Cádiz-Sevilla on the A-4, take exit 635 Jerez-Parque Empresarial, once you arrive at the roundabout, take the first exit on the right and after 50 meters turn left on Avenida de los Empresarios, the fourth street on the left. Right is the Street of Investigation and at the end of the street on the right side you have reached your destination. From Sevilla-Cádiz on the A-4, take exit 635 Jerez-Parque Empresarial, once you arrive at the roundabout, take the second exit, take the bridge over, cross the roundabout straight and 50 meters turn left on Avenida de los Entrepreneurs, the fourth street on the right is the Street of Investigation and at the end of the street on the right side you have reached your destination.